Follow the publication below to find out which are the PGBK Canon cartridges in printers, if you have any questions, type a comment. Many people can get to ask, why your printer uses Canon cartridges PGBK? and what difference do these normal BK? 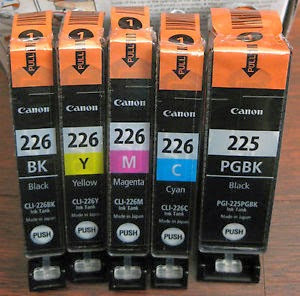 As we can see in the picture, we first have the ink cartridge BK 226, and in the end we have the ink cartridge PGBK and although it is black also its number is 225 — different from the other black — that a person who does not have much experience with printers can frustrate a bit. Then I'll explain... both ink cartridges are black, only the printer needs a more intense type of black and that will not stick to the material where it is printed, so you need a pigmented ink cartridge. For they do not know what a pigmented ink cartridge, I recommend publishing the difference between cartridges and water-based pigmented ink cartridges. Normally these to print photos as the quality is not that it is better, if the pictures need no brightness that can only give pigmented cartridges. Which means PGBK call (Pigment Black) referring to the ink cartridge as seen in the bigger picture. Cartridge for normal, brings more ink cartridge with water-based, and its durability is longer, you should not let this cartridge is spent completely.